Purified Mouse IgG (PMP01) used as coating reagent in a direct ELISA detected with Rat anti Mouse Kappa Light Chain:HRP (MCA152P). 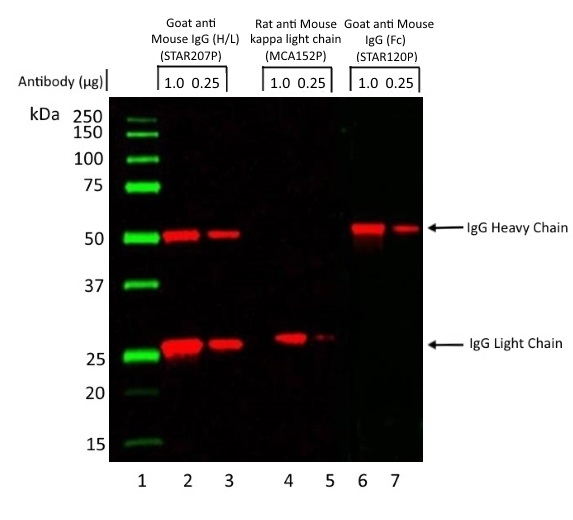 A Mouse monoclonal antibody of the IgG1 isotype was run under reducing conditions on SDS PAGE using the Bio-Rad V3 system and transferred to a PVDF membrane. Bio-Rad Precision Plus molecular weight marker was run in lanes 1 and 5. 1, 0.5 and 0.25 ug of antibody were run in lanes 2, 3 and 4 and 6, 7 and 8 respectively. Protein detection was carried out on lanes 2, 3 and 4 using Goat anti Mouse IgG (H/L):HRP (STAR207P) at a dilution of 1/10,000. Detection was carried out on lanes 6, 7 and 8 using Rat anti Mouse Kappa Light Chain:HRP (MCA152P) at a dilution of 1/1,000. Visualization was carried out using the Bio-Rad ChemiDoc with automatic exposure time. STAR207P is specific for both the heavy (50kDa) and light (25kDa) chains whereas MCA152P is specific for the light chains. HeLa (lanes 2, 5 and 8) and HepG2 (lanes 3, 6 and 9) cell lysates were run under reducing conditions on SDS PAGE using the Bio-Rad V3 system and transferred to a PVDF membrane. Bio-Rad Precision Plus molecular weight marker was run in lanes 1, 4 and 7. 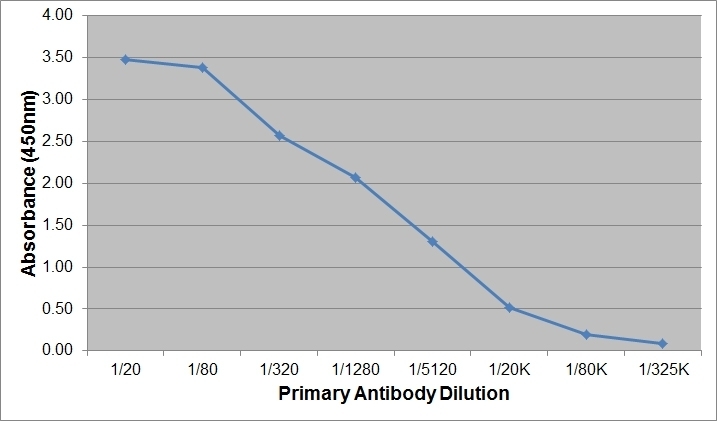 A Mouse anti Human GAPDH (MCA4740) was used as the primary antibody at a dilution of 1/1000. 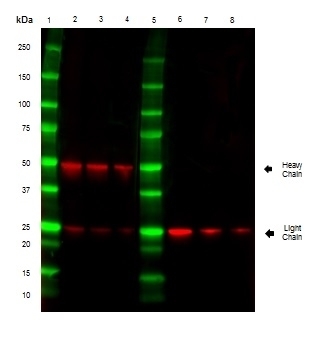 Rat anti Mouse Kappa Light Chain:HRP (MCA152P) was used as the secondary antibody at 1/1000 (lanes 2 and 3), 1/5000 (lanes 5 and 6) and 1/10000 (lanes 8 and 9). Visualization was carried out using the Bio-Rad ChemiDoc with automatic exposure. 1 μg and 0.25 μg of antibody was run in lanes 2, 4 and 6 and lanes 3, 5 and 7 respectively. Protein detection was carried out on lanes 2 and 3 using Goat anti Mouse IgG (H/L):HRP (STAR207P) at a dilution of 1/10,000. Detection was carried out on lanes 4 and 5 using Rat anti Mouse Kappa Light Chain:HRP (MCA152P) at a dilution of 1/1,000. Detection was carried out on lanes 6 and 7 using Goat anti Mouse IgG (Fc):HRP (STAR120P) at a dilution of 1/5,000. Visualization was carried out using the Chemidoc™ Touch Imaging System. 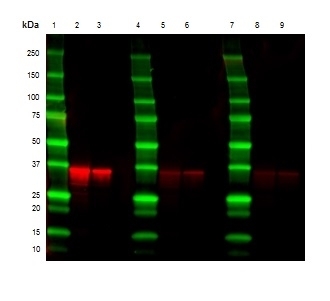 Rat anti Mouse kappa light chain antibody, clone OX-20 recognizes the kappa light chain of murine immunoglobulins. OX-20 does not recognize mouse lambda light chains or bind to the immunoglobulin heavy chain. Spleen cells from an immunized PVG.RT1c rat were fused with cells of the rat Y3 Ag.1.2.3 myeloma cell line. Mason, D.W. et al. (1981) The rat mixed lymphocyte reaction: roles of a dendritic cell in intestinal lymph and T-cell subsets defined by monoclonal antibodies. White, R.A. et al. (1984) Differentiation markers in the Drosophila ovary. J Embryol Exp Morphol. 84: 275-86. Meyer, K.B. et al. (1990) The importance of the 3'-enhancer region in immunoglobulin kappa gene expression. Nucleic Acids Res. 18 (19): 5609-15. Thomas, M.J. et al. (1999) CD8 T-lymphocyte-mediated regulation of ovalbumin-specific murine IgE responses. Int Arch Allergy Immunol. 118 (2-4): 289-91. Wasserman, G.M. et al. (1993) An approach to development of specific T-lymphocyte lines by use of preprocessed antigens in Plasmodium vinckei vinckei murine malaria. Infect Immun. 61 (5): 1958-63. Thomas, M.J. et al. (2002) CD8 T cells inhibit IgE via dendritic cell IL-12 induction that promotes Th1 T cell counter-regulation. J Immunol. 168 (1): 216-23. Salagianni, M. et al. (2007) An essential role for IL-18 in CD8 T cell-mediated suppression of IgE responses. J Immunol. 178 (8): 4771-8. Galfrè, G. et al. (1979) Rat x rat hybrid myelomas and a monoclonal anti-Fd portion of mouse IgG.